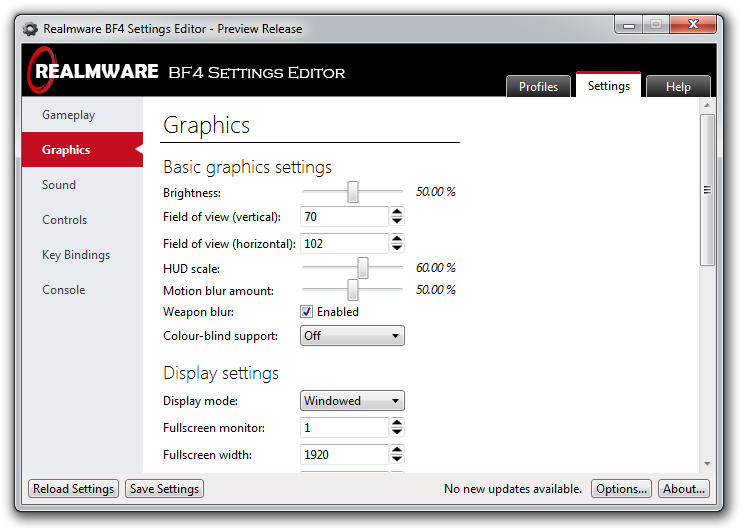 BF4 Settings Editor preview release! We have just released a preview version of our BF4 Settings Editor! 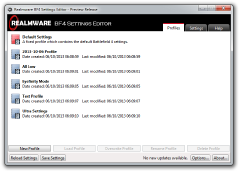 This program allows you to customise your Battlefield 4 settings without having to launch the game. This can save you a lot of time, not only because the game can take a long time to load, but also because you need to log into both Origin and Battlelog before you can start it! With BF4 Settings Editor, there’s no need to worry about the round ending while you’re changing your settings, or getting kicked for being idle. 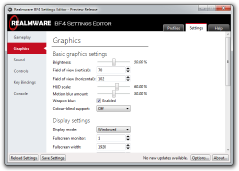 You may remember that we had several popular tools for Battlefield 3, including a BF3 Settings Editor. We have built on what we learnt from producing that tool, and have rewritten most of the code from the ground up to be more stable, reliable, and optimised. Many of the feature requests we got for BF3 Settings Editor have been included in BF4 Settings Editor, and all of the known bugs should be fixed. Please note that this is a preview release! Whilst we have been working on the framework for this tool for quite a while, we have only actually had access to the Battlefield 4 Beta for a few days. This means we haven’t had much time to implement everything that we intend to. As a result, some new options are currently unavailable, such as the spectator key bindings. Furthermore, this preview release version will only work with the Battlefield 4 Beta. We are still working on this program and will be continuing to release updates for it. The full version of BF4 Settings Editor will include the ability to easily share configurations with others online via a special code, as well as the ability to set multiple key bindings for the same control. Stay tuned for more details! The majority of game settings are supported, including key bindings with keyboard, mouse, gamepad, joystick, and Xbox 360 controller support. For your safety, a backup of your settings will be automatically created when you first run BF4 Settings Editor. You can create additional backups at any time with a click of a button. A built-in profile manager allows you to save and restore different configurations on demand. For example, you might create a profile for all low settings, and another profile for ultra settings. You can easily configure console commands to be automatically entered into the game on start-up. You can import your older Battlefield 3 settings into Battlefield 4 with a single click. Note that mouse sensitivity settings are currently not imported, as they work differently in the two games. We’re looking into this for a future version. BF4 Settings Editor detects file errors when loading your settings, and can automatically repair them for you if you wish. You will be able to see details about each of these errors to make an informed decision. No more corrupt settings files! Two screenshots of this program are included below. If you would like to see more, then check out the screenshots page on our BF4 Settings Editor microsite. This tool only really has two system requirements. Operating system: For the greatest user experience, you should be running either Windows 7 or Windows 8. However, you can still use this with Windows Vista, as long as you have at least Service Pack 2 installed. .NET Framework: As this program is written for the .NET Framework 4.5, you will need that installed. If you are using the setup exe (which is recommended), you don’t have to worry about it; it’ll all be taken care of for you. If you are using the zip archive, you can download the .NET Framework 4.5 here. If you would like to download this program and try it out, then head over to the downloads page on our website. We recommend that you choose the setup exe option, but you can also download the program files as a zip archive if you prefer. This tool includes an automatic update checker, so you will be notified within the program whenever a new update is available (unless you choose to disable this function). This means that you can stay up-to-date with the latest features and fixes. Good luck in further improving your useful little programs. The developers at DICE once again with individual settings not worry about. There may or may not be a workaround for this issue. We’ll investigate it and see what we can do! This is not working at all WTF? DICE silently released a patch for the Battlefield 4 Beta, which changed the location of the settings files, breaking BF4 Settings Editor in the process. They didn’t announce this patch anywhere, so unfortunately we weren’t aware of it for a while. A hotfix has just been released, so the latest version is working. Sorry about that! I updated to the (first) BF4 beta patch today and something broke. All settings were restored to default (probably by the patch) but BF4 settings editor still sees the old settings and any changes I make are not applied in game. So something must’ve changed from the beta version to the patched version. btw, thanks for this tool! It’s great! DICE silently released a patch for the Battlefield 4 Beta, which changed the location of the settings files, breaking BF4 Settings Editor in the process. Your settings being restored to the defaults was caused by that patch, yes. We have just released a hotfix, so the latest version of BF4 Settings Editor is working. We also added in an option to copy your settings over from the old location to the new location. unable to load file settings. try to later!!! I do not know what I’m doing wrong, yesterday BF4SE worked nicely, but today the game does not work at all 🙁 Is it possible that it caused yesterday’s game update? Please advice. Thank you. Is not that the reason why the tool does not communicate with the game? Yes, that was the reason for this issue. DICE silently patched the game without any announcement, and this patch changed the location of the settings files from the “Battlefield 4” folder to a new “Battlefield 4 Beta” folder. We have just released a hotfix, so the latest version of BF4 Settings Editor is working. Yes, DICE silently released a patch for the Battlefield 4 Beta, which changed the location of the settings files, breaking BF4 Settings Editor in the process. They didn’t announce this patch anywhere, so unfortunately we weren’t aware of it for a while. We have just released a hotfix for this issue, so the latest version is working. Sorry about that! Thanks for the quick response and especially for instrument repair. Hopefully by DICE those interventions will be the least 🙂 You do not have to apologize for. Any idea if this will work straight ‘out of the box’ with the full release of BF4 on Tuesday? 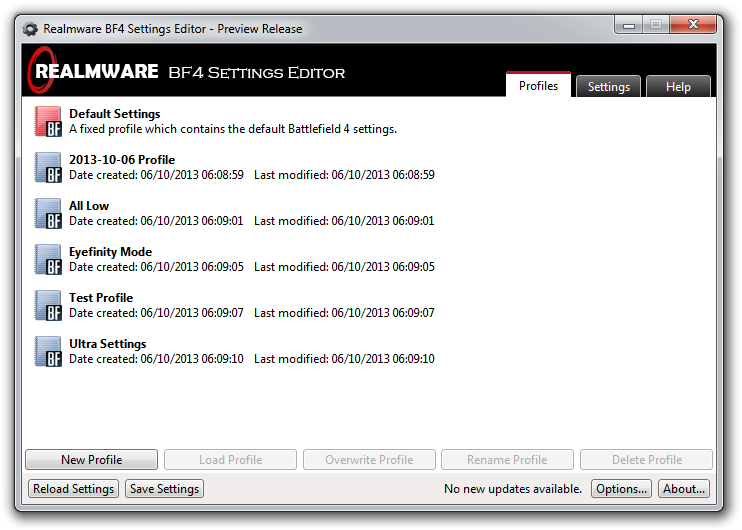 We have just released version 1.0 of BF4 Settings Editor, which is compatible with the full release of Battlefield 4. Be sure to get the latest version! The software dosent seem to save my changes to any new profile that i create. Created date and modified date remain the same even though I make changes and press the save changes button it isnt saving it to the profile. What I have found out is that if I make all the changes I want then save as a new profile then theses changes are saved but its not the correct way to do things. i.e press save you expect it to save to the file. Also an indication of with profile has been loaded would be nice i.e displays the name of it. Can you tell me how I load a backed up profile? Assuming you’re talking about a backed-up copy of the Profiles folder (My Documents\Battlefield 4\settings\Profiles), it should simply be enough to put the backed-up folder back into the original location. BF4 Settings Editor will read the profiles contained in the Profiles folder, and show them in the Profiles tab. If, however, you’re talking about a backup created using the Create Settings Backup button in BF4 Settings Editor, then the steps required are rather different. If you open up the backed-up Zip archive (stored in My Documents\Battlefield 4\settings\Backups), you should find three files inside: PROFSAVE, PROFSAVE_profile, and user.cfg. The first two files, PROFSAVE and PROFSAVE_profile, should be extracted to the My Documents\Battlefield 4\settings folder. The last file, user.cfg, should be extracted to the Battlefield 4 installation directory (for example, C:\Program Files (x86)\Origin Games\Battlefield 4). Hi guys, like the tool and have used it to tune my BF settings for hours. Bit of a problem just now. I created a settings backup. Then I restored the BF4 default settings as I had “lost” a bind and wanted to find what command “Q” went with. I then copied the 3 backup files into the BF4 directory but the game starts with the defaults. Have I made a mistake or have I just lost all the setup work? Any help appreciated … will be hours to rebuild all binds for kb, mouse and joystick. If you open up the backup Zip archive (stored in My Documents\Battlefield 4\settings\Backups), you should find three files inside: PROFSAVE, PROFSAVE_profile, and user.cfg. The first two files, PROFSAVE and PROFSAVE_profile, should be extracted to the My Documents\Battlefield 4\settings folder. The last file, user.cfg, should be extracted to the Battlefield 4 installation directory (for example, C:\Program Files (x86)\Origin Games\Battlefield 4). I hope this helps!